I just setup my SnapChat account – mdtravelstories. Add me as a friend then tell me how it works! I have a lot of learning to do. Author Brent JacksonPosted on April 8, 2016 April 8, 2016 Tags SnapChat, Social MediaLeave a comment on Just Joined SnapChat! I’m trying to grow as a blogger. I joined a few blogger groups on Facebook so I could network and learn from other bloggers. I’m glad I did it because I am networking and learning. One of the Facebook groups I joined is Blogging Newbs. It’s basically an online support group for people who have been blogging for less than two years. This is a good group to ask questions, get general blogging information and get ideas. It’s a very active group. “I’m told the average blogger can expect to spend 2 years building up a good following and engagement. Writing talent can speed the process up. Good social media can speed the process. Networking and exposure can speed the process. Guest posting on other blogs can speed the process. Pay attention to the posts that get you the best response and do more of those posts. Always ask for feedback from successful bloggers on how you can improve your blog. POST CONSISTENTLY!!! To my fellow bloggers, this is my answer to the question. How would you answer? Let me start by giving credit where credit is due. Much of the approach for my Social Media Content Plan came from How To Create A Social Media Marketing Plan In 6 Steps on HootSuite. This is a new blog so I have a simple content plan. Here’s the history of the work so far. I completed my 2016 Blogging Goals. I started the planning process for social media. I completed a Social Media Audit and set priorities. Now it’s time for a content plan. What type(s) of content do I intend to post and promote via social media? How often you will post the content? Assumption I – The social media channels I will use for Maryland Travel Stories (MTS) are Facebook (7 followers), Twitter (38 followers), and Pinterest (1,545 followers). Other channels will be add when MTS is large enough that I can hire a virtual assistant. I currently outsource some graphic design work. Assumption II – All activities around social media will be time budgeted in three categories: channel monitoring, content generation and engagement support. Currently, channel monitoring consumes 50% to 60% of the social media budget due to post sharing within each channel and limited followers for MTS. This number will decrease as engagement increases. Content generation will be limited to sharing posts from MTS and guest posts by me across channels. What type(s) of content do I intend to post and promote via social media? Posts from MTS. I will also share interesting and relevant content from within each channel. Guest posts by me will be shared across all channels. How often you will post the content? Channel monitoring is done daily. Any interesting and relevant content will be shared immediately. Post from MTS and guest posts will be shared within 24 hours of the post being published. How will I promote the content? There is no budget to promote content on any channel at this time. I plan to start testing promoted posts on Facebook in April 2016. 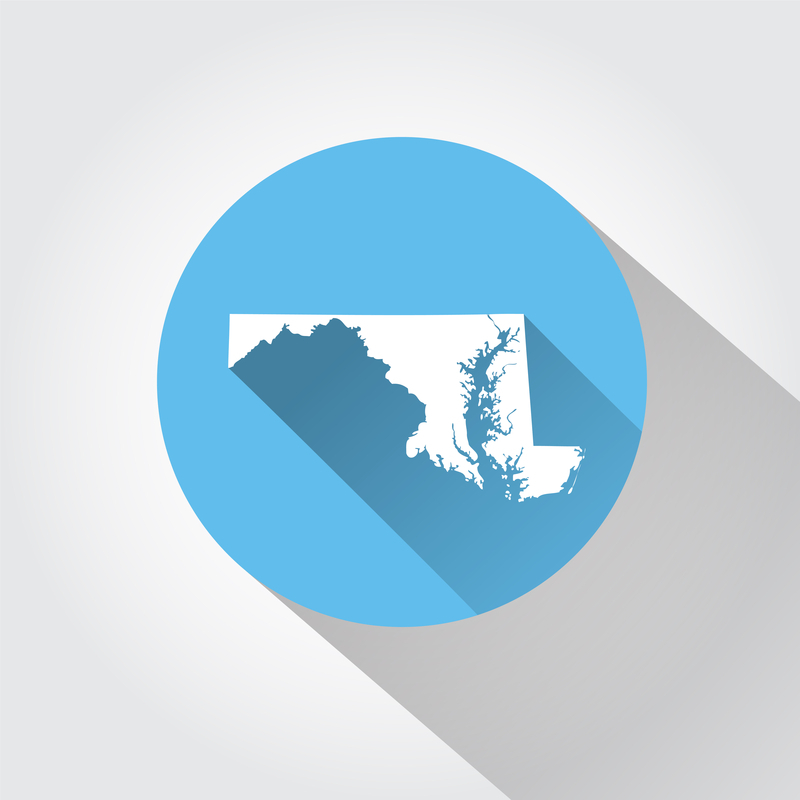 Facebook (7 followers) – I have a page setup for Maryland Travel Stories (MTS). I share most of the posts from the blog there as well as other stories I find on Facebook. Twitter (38 followers) – MTS has a profile setup. I tweet most of the posts from the blog and retweet other stories. Pinterest (1,543 followers) – This is my personal profile but I have boards setup to support MTS. The profile I setup for MTS is no longer active. The two most popular boards are Coffee Shop Stuff and Bucket List Ideas. Google+ (1 follower) – MTS has a page setup. There’s a widget installed that automatically shares any post from the blog on the page. No other activity. Instagram (1 follower) -I created a profile but the setup is not complete and there are no photo posted. Priority #1 – Lower social media as a priority – Simply put, I don’t have enough hands and there are not enough hours in a day. I’m giving myself permission not to worry too much about sharing on social media. There are days when I spend three times as much time planning, posting and sharing on social media as I do creating the content I’m sharing … NUTS! This turns the fun of blogging into the chore of marketing … and adds all the stress! Of course I’ll be singing a different tune if I win the lottery or get a call from Oprah. It could happen. Focus on Facebook, Twitter and Pinterest – I have limited time and I have to focus. If I find a way to monetize the blog, I can add more social media channels by outsourcing the work. I already have a great recommendation for a virtual assistant. Content Plan – Working on it now. This will be the next post for social media planning. Conduct a Social Media Audit – Assess current social media channels, usage (if any) and results. Define Social Media Priorities – I once gave presentations to small business people on how to use social media. And, I’m still very much a social media enthusiast. However, I know social media can consume all your time if you let it. It’s a lot of work! There are hundreds of social media sites and more are added weekly it seems. I have to decide which sites stay. Which sites go. Which sites get added. Well, this is the plan starting out. I’ll keep you posted. If you have any written social media goals or plans for your blog, please share! We can start a club and have t-shirts made. I blog about Maryland but I live just over the line in Virginia. 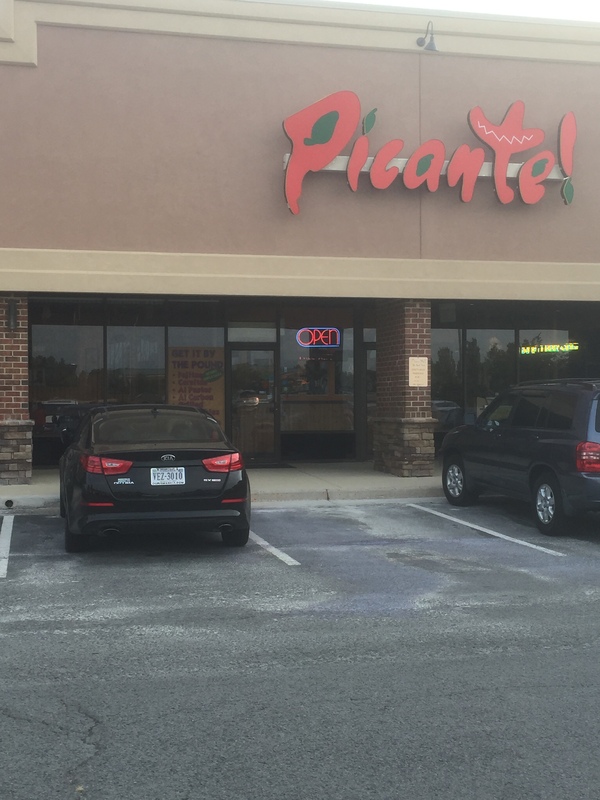 My wife and I stopped by Picante! Mexican Restaurant a few days ago for a quick meal. I smiled as soon as I saw the front door (see 2nd picture). This place is social media savvy! I love a business that understands engagement with its customers. 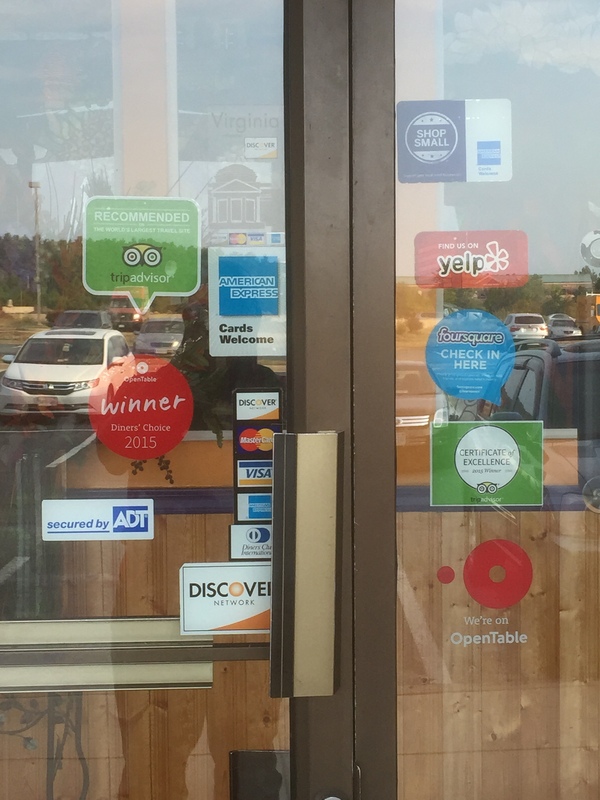 Most restaurants are active on TripAdvisor and OpenTable. One glance at this front door tells me they are active on (or at least monitor) a profile on Yelp and Foursquare. I checked the website and you can easily find links to their Twitter and Facebook profiles. The key for me is “easily find”. 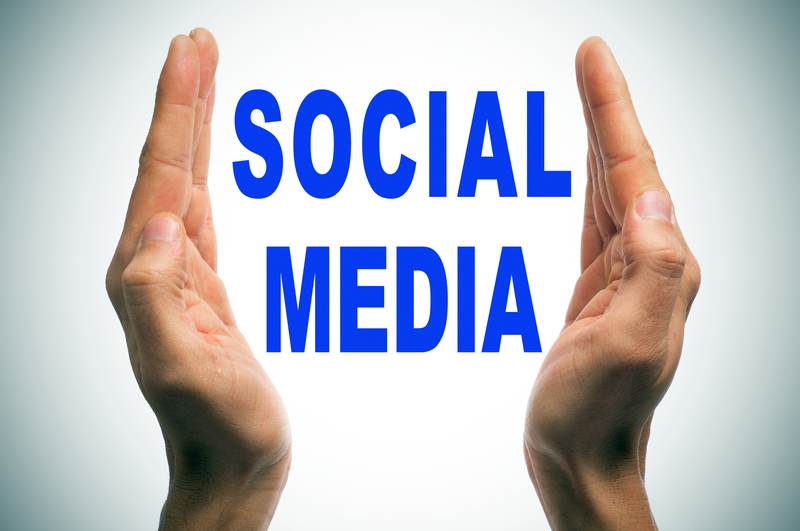 Many businesses have social media profiles but you would never know it. There’s nothing on the front door, the inside walls or the website. You have to send out a search party to find any social media for the business. I found two blogger networking groups; Virginia Bloggers and Maryland Bloggers. (I blog about Maryland but I live in Virginia so I can benefit from both.) I’m looking forward to learning and networking with other bloggers. I’ve been actively searching for a way to network. I’m very happy to have this off my to do list. I’m consolidating my two Pinterest profiles. I will keep the Maryland Travel Stories profile to protect the name. However, all future boards and pins will be on my personal Pinterest profile. It’s just easier this way! Lastly, my Facebook page is up! YAY! Now I can get back to posting! As I said in my last social media post, social media is a lot of work!